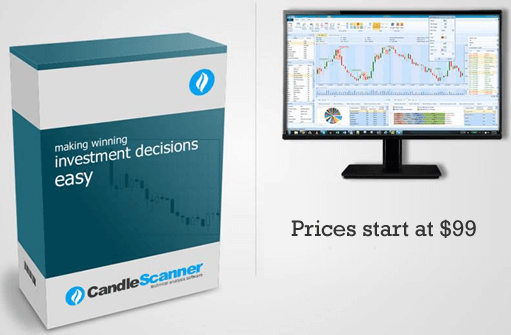 CandleScanner™ is a technical analysis software package created for investors interested in Japanese candle patterns. What makes this application exceptional is that, from the outset, it has been specifically designed for the detection of Japanese candle patterns. It is not just an add-on to an existing analysis platform, but a specialist charting application written by people with an extensive knowledge of the topic of Japanese candlestick patterns. It is suitable for both seasoned traders and complete beginners. The application of CandleScanner™ is extremely versatile, and can be used by a whole spectrum of traders involved in, for example, stock market trading, commodities markets, futures markets or forex. Also, those who are just beginners will find CandleScanner™ a great learning and training tool, where they can learn from real-life data-based examples, rather than just pure text book theory. So, what can the CandleScanner™ application achieve? Measure the efficiency of patterns, i.e. are they working as you expect them to? CandleScanner™ is highly configurable, meaning that you can adjust it to your specific needs. The algorithms scanning the candlesticks charts have many parameters, which can be set by the user. Also, the visual aspects of the application are highly customizable, enabling everyone to find their desired optimal settings. Japanese candle patterns are well known and routinely implemented in displaying price behavior. However, when apparent emerging patterns are analyzed and discussed, it is frequently the case that the conclusions are imprecise, and, indeed, often result in contradictory interpretations of what the patterns are actually saying. Hence, to accurately implement a tool scanning charts for candle patterns is not a straightforward undertaking. Candle patterns are very interesting for traders due to their simplicity, elegance and natural interpretation of market sentiment. No matter how markets evolve, "patterns" will appear on the charts. Essentially, the core premise, and assumption, underlying the application of technical analysis is that such patterns are repetitive and detectable. Technical analysis is widely employed in various financial markets, informing traders about the non-fundamental determinants of price, in other words, "market sentiment." Why CandleScanner may help you? Observing an apparent repeating pattern on a chart can result in completely different trading outcomes. Experienced traders know that the efficiency of an investment decision depends not only on the analytical tool(s) employed, but also on other factors, such as risk and position management. In this regard, CandleScanner™ can be implemented as an objective tool aiding the trader in taking positions, based on the systematic evaluation of price behavior. Trying to identify patterns manually, or visually, by merely scanning the charts can be problematic. It can be also be dangerous, as there may be a tendency to see patterns, where there are none, in random data. For example, the very successful trader, William Eckhardt, in the Jack Schwager book “The New Market Wizards”, says that we as human beings don’t look at data neutrally. That is, when the human eye scans a chart it doesn’t give all the data points equal weight. Instead, there is a tendency to focus on certain "outstanding" cases, and to form opinions on the basis of these special cases. That’s why when Eckhardt has an insight based on a chart pattern, he tries to reduce it to an algorithm that can be tested on a computer. In order to investigate whether or not the insight has any value, it should be explicitly formulated, tested and evaluated. In this regard, an objective assessment has a lower chance of being biased, which is crucial when making trading decisions. Finally, recalling Warren Buffet's (alleged) reflection on the markets: "I'd be a bum in the street with a tin cup if the markets were efficient." CandleScanner can help you exploit such inefficiencies.